As a tuckpointing and masonry contractor in North Chicago IL, we’ve been using high pressure washing equipment on a daily basis. Pressure washers are a very fast and efficient way to remove debris, dirt, dust, grime, mold, and even paint from the surfaces we are working on. It saves us time and provides you with a clean surface after our work is finished. 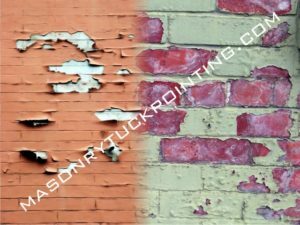 A typical use of pressure washing in North Chicago IL for a tuckpointing contractor is to remove dust and debris from the surface that’s being preparing for re-pointing. Besides cleaning your masonry wall, power washing and wetting of the surface ensures maximum bond of the new mortar. In case you have plans to use your own high pressure washing equipment in North Chicago IL, here are some tips that might save you time and lessen the frustration. If you don’t feel like experimenting or the job is simply too big and difficult, give us a call and will be happy to examine your site and provide you with a high pressure washing North Chicago IL and / or paint removal estimate.